Climate change in Africa was asynchronous; where one region may have experienced a wet phase, another one may have experienced a dry one. Moreover, its variations did not correspond perfectly with Marine Isotope Stages and glaciation cycles. The impact of wet and dry phases may be different by region. A wet phase in the Sahara means more vegetation and game, and more people; by contrast, a wet phase in a tropical region means more and denser rainforest, and more hardship. 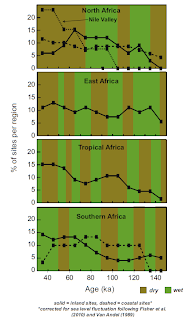 The middle regions of Africa were more shielded from climate change than either north or south Africa: human occupation appears more even; however, West and East Africa seem to have been following opposite trajectories: "Relative site abundances in tropical Africa increase during one period of aridity (~115-90 ka), and in East Africa decline during the comparable interval of humidity (~110-95 ka)." Hominin dispersals to Eurasia via northern Africa have also been linked to humid intervals (Osbourne et al., 2008; Drake et al., 2011). From ~30-75 ka, North Africa experienced arid climate regimes. The Sahara expanded 65-50 ka and the demographic data imply abandonment of the interior of North Africa during this time (Fig. 15), suggesting that dispersals from North Africa occurred prior to 75 ka. This finding is at odds with hypotheses that posit a dispersal timing of ca. 60 ka (Mellars, 2006), or a dispersal origin in the South African Howiesons Poort industry at 65-60 ka (Marean, 2010), although a ca. 65-60 ka dispersal could well have occurred from East Africa over the Bab el-Mendeb, as humid conditions dominated the latter region between 80 and 65 ka. The timing of the humid intervals in North Africa (~135-115 ka and ~105-75 ka) corresponds with those in the Levant (54a) (Vaks et al., 2007), providing multiple opportunities for one or more earlier hominin dispersals out of Africa via the Sahara, or an early exodus from East Africa to Arabia over the Bab el Mendeb (e.g., Rose et al., 2011). This pattern does not rule out possible migrations from this region during either the earlier or the later interval through the Nile Valley. However, during the ~105-75 ka humid interval in North Africa, East Africa (where the sources of the Nile occur) was largely under an arid climate regime, except for a narrow window ~80 ka when both northern and eastern Africa were experiencing humid climates (Fig. 15), placing a more restricted temporal window on dispersal via the Nile Valley. We note that although only one out of Africa event is recorded in the modern human genome (e.g., Prugnolle et al., 2005), this fact is not inconsistent with earlier multiple migration and extinction events using any of these routes, with only a single lineage surviving to the present. The 135-115ka humid interval in the Sahara and the Levant could explain the origin and growth of a population that would spill over to Asia at this time. Jebel Faya may date to this period. ~115ka the onset of dryness would have been detrimental to populations in the Sahara-Arabia belt. 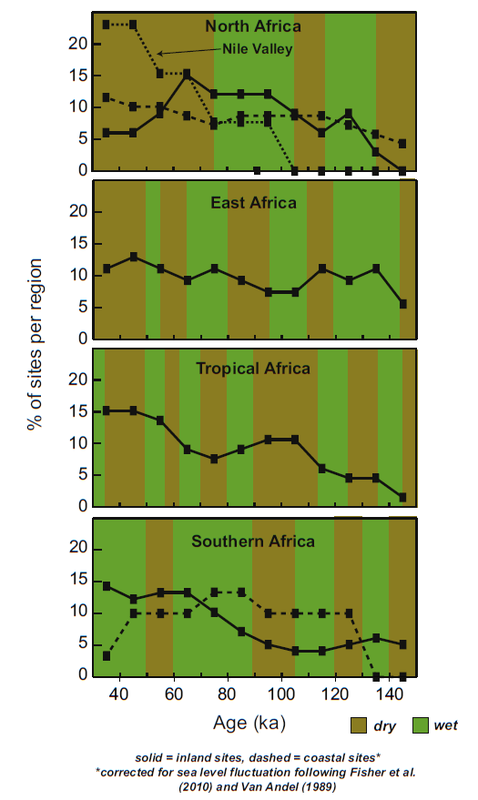 It is at this time that site abundances increase in tropical Africa which is also becoming drier, and hence more conducive to human occupation (less dense rainforest); we can perhaps infer that the deepest human lineages got isolated from the rest of mankind as they entered tropical Africa, and even reached Southern Africa which was humid at this time. Post 105ka we see another wet phase in North Africa/Levant, which would again spill over to Asia; the Nubian Complex appears at around this time in Arabia. There are uncertainties of dating about the Skhul/Qafzeh modern humans, and they may date from this time, or the previous wet period (135-115ka). At the 70ka mark where something big may have happened, North Africa/Levant go to a dry period; this is perhaps a good time to see survival of a few lineages (mtDNA L3 and Y-chromosome BT and CT) and another exodus of modern humans from this area. An exodus from East Africa at this time would not make much sense because humans would go from a humid region to a dry one; it would be an awful time for Africans to be headed to Asia. J Hum Evol. 2012 May;62(5):563-92. Epub 2012 Apr 17. The environmental context for the origins of modern human diversity: a synthesis of regional variability in African climate 150,000-30,000 years ago. Blome MW, Cohen AS, Tryon CA, Brooks AS, Russell J.
Abstract We synthesize African paleoclimate from 150 to 30 ka (thousand years ago) using 85 diverse datasets at a regional scale, testing for coherence with North Atlantic glacial/interglacial phases and northern and southern hemisphere insolation cycles. Two major determinants of circum-African climate variability over this time period are supported by principal components analysis: North Atlantic sea surface temperature (SST) variations and local insolation maxima. North Atlantic SSTs correlated with the variability found in most circum-African SST records, whereas the variability of the majority of terrestrial temperature and precipitation records is explained by local insolation maxima, particularly at times when solar radiation was intense and highly variable (e.g., 150-75 ka). We demonstrate that climates varied with latitude, such that periods of relatively increased aridity or humidity were asynchronous across the northern, eastern, tropical and southern portions of Africa. Comparisons of the archaeological, fossil, or genetic records with generalized patterns of environmental change based solely on northern hemisphere glacial/interglacial cycles are therefore imprecise. We compare our refined climatic framework to a database of 64 radiometrically-dated paleoanthropological sites to test hypotheses of demographic response to climatic change among African hominin populations during the 150-30 ka interval. We argue that at a continental scale, population and climate changes were asynchronous and likely occurred under different regimes of climate forcing, creating alternating opportunities for migration into adjacent regions. Our results suggest little relation between large scale demographic and climate change in southern Africa during this time span, but strongly support the hypothesis of hominin occupation of the Sahara during discrete humid intervals ~135-115 ka and 105-75 ka. Hominin populations in equatorial and eastern Africa may have been buffered from the extremes of climate change by locally steep altitudinal and rainfall gradients and the complex and variable effects of increased aridity on human habitat suitability in the tropics. Our data are consistent with hominin migrations out of Africa through varying exit points from ~140-80 ka. An exodus from East Africa at this time would not make much sense because humans would go from a humid region to a dry one; it would be an awful time for Africans to be headed to Asia. East Africa is only humid during the 80-65 kya period, followed by a dry period ~65-55 kya. I presume that is why the authors suggest a migration via the Bab-el-Mandeb is the only plausible candidate for a 65-60 kya migration out of Africa. This seems like a very good match for the estimated coalescence of Y-DNA CT and mtDNA L3. "An exodus from East Africa at this time would not make much sense because humans would go from a humid region to a dry one; it would be an awful time for Africans to be headed to Asia." Except for coastal populations, who might spread northwards (and ultimately eastwards) along the coast, looking for warmer waters ......? "I'm definitely glad that someone thought to write it. For the time being I will try to sanity-check my own two deserts"
A most interesting paper. Thanks for posting. "periods of relatively increased aridity or humidity were asynchronous across the northern, eastern, tropical and southern portions of Africa". "An exodus from East Africa at this time [At the 70ka mark] would not make much sense because humans would go from a humid region to a dry one; it would be an awful time for Africans to be headed to Asia". Yet another blow against the Bab al Mandab theory. "Except for coastal populations, who might spread northwards (and ultimately eastwards) along the coast, looking for warmer waters ......?" A purely coastal migration raises all sorts of problems. For a start much of the coast would be cliffs. Difficult to walk along the coast in such situations. As would be extensive mangrove swamp. Of course the migrating humans can then move inland, but can any such migration then be called 'coastal'? Besides which if they could survive effectively inland why would they move back to the coast? Another reason is that the coast is a relatively narrow ecological region and any population looking to move far along it would be of limited size and rapidly suffer inbreeding depression. A 'coastal migration' has never made sense to me. "...... A 'coastal migration' has never made sense to me." Good points, but the coastal environment is extremely rich in resources and to my mind, obstacles such as cliffs and mangrove swamps, would have been the stimuli to spreading further more quickly. Coastal people would have felt it worthwhile to trek past such obstacles to find new beaches ( bit like surfers :-)). There was nothing to stop them breeding with inland populations along the way, whatever the species. "the coastal environment is extremely rich in resources"
Only some of it. Other stretches need sophisticated equipment to enable exploitation.
" obstacles such as cliffs and mangrove swamps, would have been the stimuli to spreading further more quickly". I don't think so. They would usually have acted as barriers. "Coastal people would have felt it worthwhile to trek past such obstacles to find new beaches ( bit like surfers :-))"
But surfers usually have motor vehicles! Some of those stretches are incredibly long and any migrating humans would probably have adapted to life inland before agaid reaching similar stretches of coastline. "There was nothing to stop them breeding with inland populations along the way, whatever the species". That is exactly correct. But that eliminates a 'coastal migration' as being any sort of 'original migration'. In many studies I come across the story that early humans could have migrated via Strait Bab-el-Mandeb to the Arabian Peninsula because 60 or 70.000 years ago the sea level was much lower. I like to point out that humans around those times never could have crossed this strait: impossible. The strait consists of two parts separated by Perim Island. The western part Dact al Mayun is 25 km wide and 170 fathom (310 m.) deep. Even if the water level would drop 100 or 200 meters (which it did not do) no human of those time could have crossed. To do that you need boats of the style like the Vikings. 70.000 years ago humans were not capable to build such boats. In other words a crossing by Bab-el-Mandeb is impossible. I agree, Dirk. To me the Bab el Mandeb theory has never stood up to the slightest critical analysis. It was only invented to explain the sudden appearance of humans in Australia assuming a young age for out of Africa. There is no need to invoke either it or a coastal migration if it is assumed humans moved out of Africa some considerable time before they reached Australia.